The 2017 U.S. Soccer Girls' Development Academy Winter Showcase Feature games conclude on Dec. 10 as Solar Soccer Club takes on the Washington Spirit Academy - Virginia at the U-16/17 level while NTH Tophat and the Penn Fusion Soccer Academy meet at the U-18/19 age level. Combined, the teams have gone 2-3-1 so far in the Winter Showcase. A total of 12 teams have had the opportunity to play in Feature games which are being streamed live on the Development Academy Facebook page, U.S. Soccer YouTube channel and ussoccerda.com. Solar Soccer Club will finish up its Winter Showcase slate after defeating Concorde Fire 4-0 in its first game and beating Beach Futbol Club on Dec. 9 by a 2-1 score. Raigen Powell scored a hat trick against the Fire while Eryka McIntyre added a single score. Powell also scored against Beach. The Spirit will have to deal with that one-two punch in the feature game as McIntyre has 12 goals this season and Powell has seven. Emily Parrott has played almost every game in goal this season. Solar is 7-2-3 so far and sits in fourth place and in playoff position in the Frontier - Central Division. The Washington Spirit Academy - Virginia fell 2-0 to Legends FC out of Southern California in its first game at the Winter Showcase and then lost 1-0 to United Soccer Alliance on Dec. 9. The Spirit is 8-5-2 this season, and sits in playoff position in fourth place in the Atlantic - East Division. The Spirit is part of the NWSL franchise and one of two DA clubs under the club's banner with the other based out of Baltimore. Jada Konte and Lauren Teuschl lead the team in scoring with five goals each. NTH Tophat came into the event unbeaten and tied Real Colorado 1-1 in its first game. It was the first goal the team has given up in the last six games. 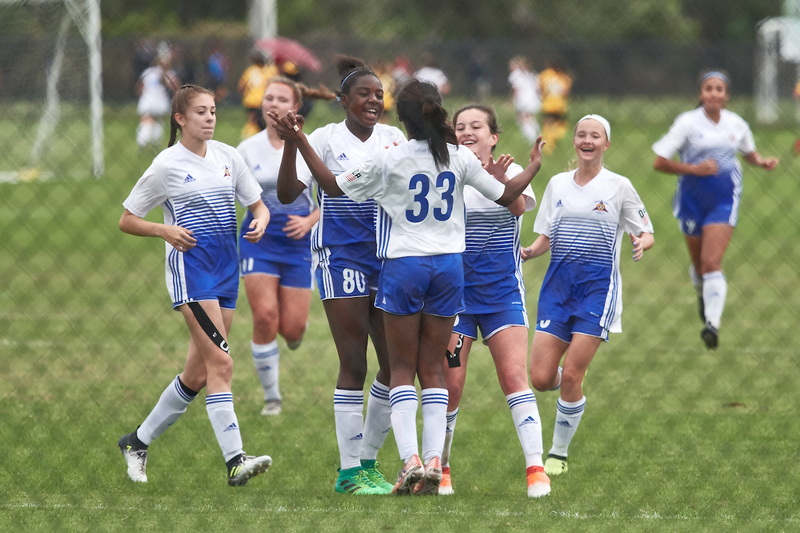 The Atlanta club has 100% of its players committed to Division I colleges, but will be without its best player - Brianna Pinto - who is playing with the U-20 Women's National Team during the Nike International Friendlies. In its second Winter Showcase game against the SoCal Blues on Dec. 8, Tophat tied 1-1 for the second game in a row. Head coach Troy Garner's side is in second place in the Southeast Division with an 8-0-3 record and features several Youth National Team players, including goalkeeper Katherine Asmann, forward Rachel Jones and defender Ella Shamburger, who all have been called in with the U.S. U-19 WNT. Charlotte Teeter leads the team in scoring with 12 goals, while Jones has bagged eight. Penn Fusion sits in third place in its Atlantic Division, but lost to Solar SC in its first Winter Showcase game, and fell in its second Showcase game to Slammers FC on Dec. 8. The setbacks were just the second and third losses of the season for Penn Fusion, which is 10-3-0 this year. Youth National Team player Rachael Dorwart, Emily Gray and Brice McInroy lead a triple-edged sword that has scored 12, 11 and 12 goals this season, respectively, as the club has scored 56 goals in 13 games.